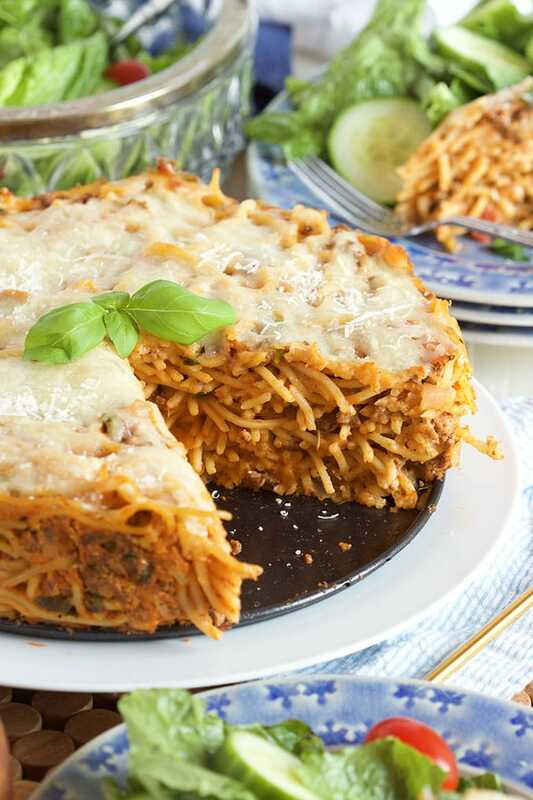 This Easy Spaghetti Pie recipe is a great way to use up leftover spaghetti and sauce! 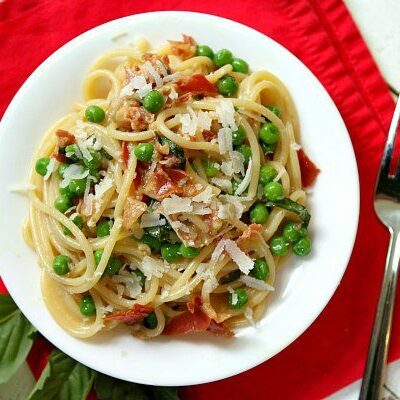 This pasta dish is a family favorite. 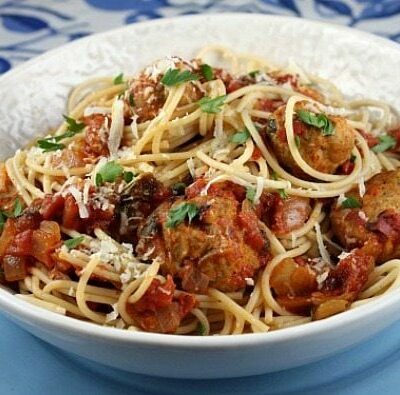 It’s so simple to make, and it’s a fun twist to the usual spaghetti and meatballs dinner. It’s fantastic for entertaining, too! Watch the video showing you how to make this Easy Spaghetti Pie, then scroll to the bottom of this post and print out the recipe so you can make it at home. Usually the winter just drags along, but I feel like this year has already gotten off to a speedy start. We haven’t had much snow over here on the East coast- just a few flurries each day, but I’m ready for one big storm. It’s the only thing that makes the cold weather bearable…until that snow starts to melt, turn brown and, generally, become a big nuisance. It’s only really nice for a day or so, then it’s not much fun anymore. Cold weather definitely gives me a good excuse to whip up some comfort food like this Easy Spaghetti Pie recipe that I remember from my childhood. We ate a ton of spaghetti growing up and there were always leftovers in the fridge. 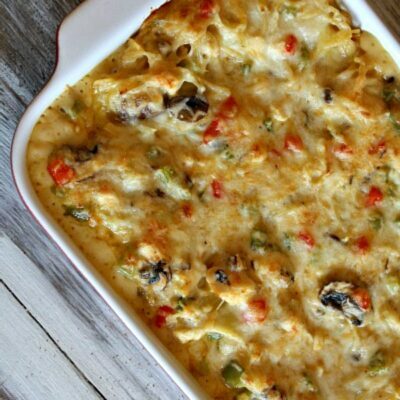 I wasn’t a big leftover fan (and I don’t think my mom was either) because spaghetti would either end up in the trash or morphed into something a little different like a fun frittata or Spaghetti Pie. 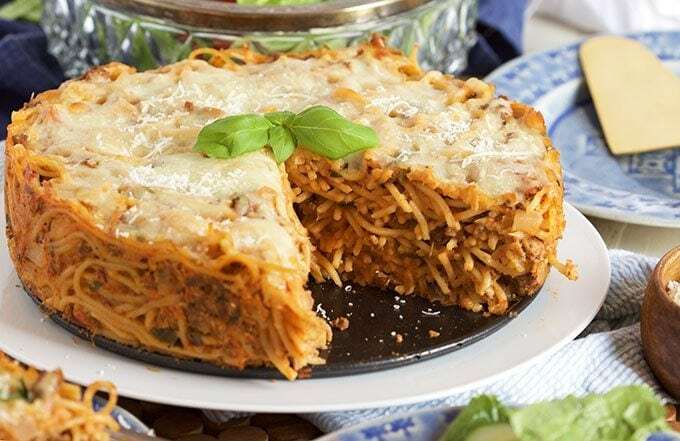 It was always a pleasant surprise to see Spaghetti Pie on the table, it’s just so impressive with the crispy edges and melty cheese blanketing the top. And since it was a pie shape, everyone got exactly the same proportion of ingredients served on their plate. There was no fighting over who had more cheese and who had more meat. 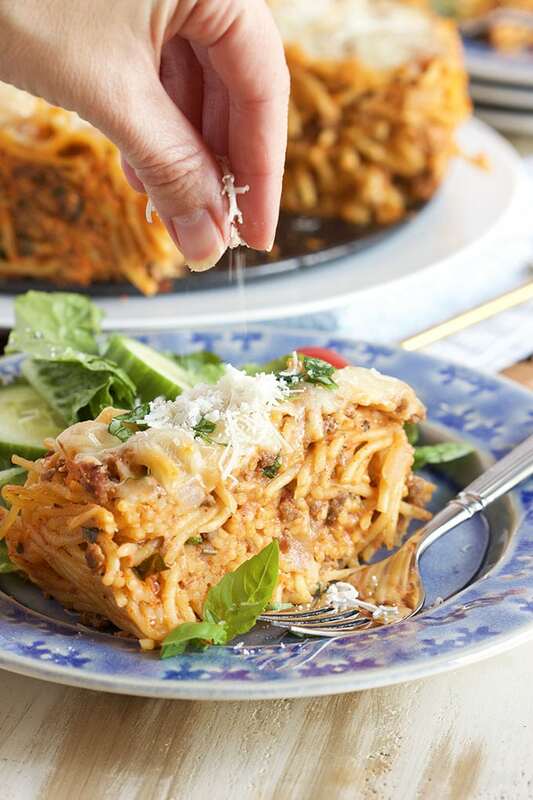 I love to serve this Easy Spaghetti Pie recipe when entertaining because it’s a great dish to assemble in advance…since it’s kind of like leftovers revamped even if you’re cooking everything when you make it. It’s easy to make a couple of pies at once too. Then you can just throw the spaghetti pies into the oven right before serving, remove from the pans and serve while your guests “ooooh and ahhhhh”. Sprinkle some fresh Parmesan on top! And the best part about this Easy Spaghetti Pie recipe is you can use whatever ingredients you have on hand. If you’re not a fan of ground beef, use turkey or sausage. 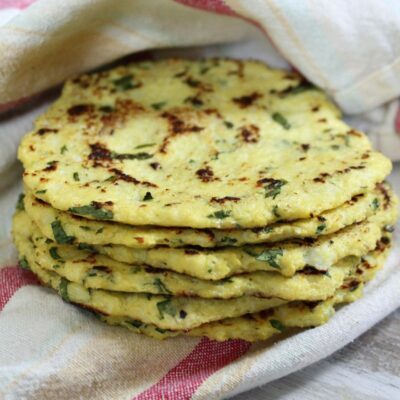 Or leave out the meat entirely for a completely meat-free dinner. Add mushrooms, peppers or broccoli, if you want. Throw in a little extra cheese (that’s what I usually do) and enjoy a totally decadent meal without slaving away all night long. The pie is yours! If you’re looking for more pasta recipes to make at home, you might like to try my Rotini with Shrimp or this Pasta with Pumpkin and Sausage. Cheeseburger Macaroni Skillet, One Pot Pasta Primavera with Shrimp, and Linguine with Tomatoes, Basil and Brie are great pasta dinner recipes too! 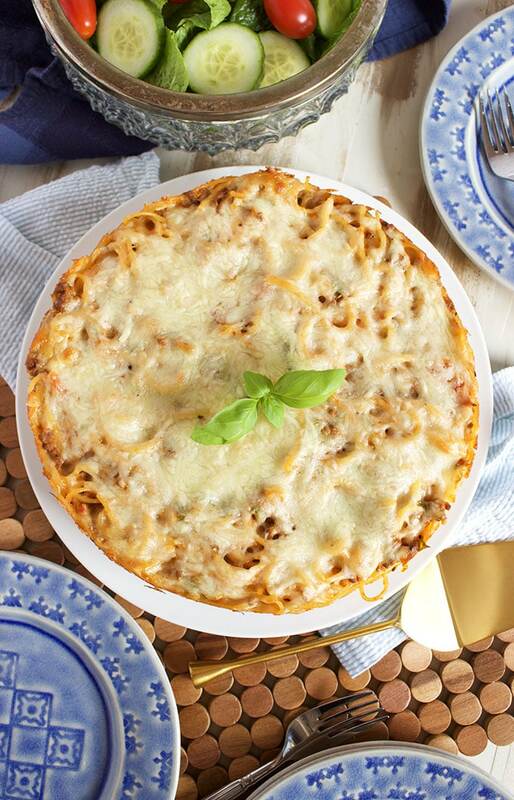 This Easy Spaghetti Pie recipe is a great, family-friendly dinner recipe. Preheat the oven to 350 degrees. Spray an 8-inch springform pan or a 9 inch deep-dish pie plate with cooking spray. 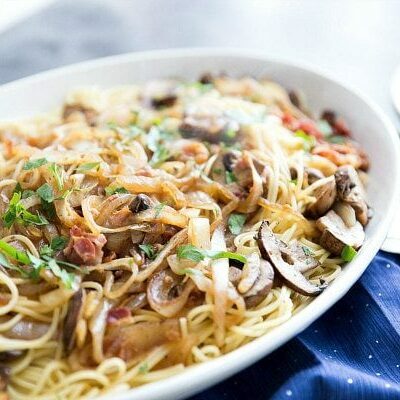 Cook the pasta in a large pot of salted, boiling water for 6 to 7 minutes or until almost al dente. (The pasta will continue cooking in the oven.). Drain and set aside. In a large skillet, brown the ground beef over medium heat until no longer pink, approximately 4 to 5 minutes. Transfer to a bowl using a slotted spoon and discard the fat from the pan (leave a couple teaspoons for sauteing the onion). Return the pan to the heat and cook the onion until softened, approximately 3 to 4 minutes. Add the garlic to the pan and cook for 1 minute. Stir in the Italian seasoning and onion powder. Remove from the heat and set aside. In a large bowl, whisk together the sauce, ricotta cheese, parsley and eggs. Stir in the onion mixture. Toss the pasta and beef with the sauce mixture to combine. Stir in 1/2 cup parmesan and 1/2 cup mozzarella. Transfer the spaghetti mixture to the prepared pan. Sprinkle the remaining cheese over the top. Bake until the cheese is melted and bubbling, approximately 25 to 30 minutes. Remove from the oven and allow to rest for 5 minutes before cutting and serving. Great comfort food, love how easy it is to make too. I love this dish so much, it’s so comforting and absolutely delicious! This is such a fun idea! A new favorite in my house! This is such a fun meal! Will definitely make it again! 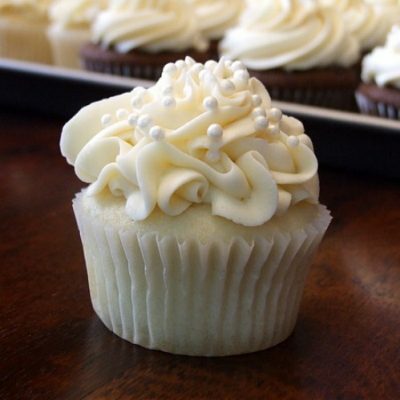 This is such a great recipe. Always a hit! This has to be the best way to eat spaghetti! Just made this last night. My husband said that this is one of the best dishes that I had made in the last few months. This is a family favorite recipe. 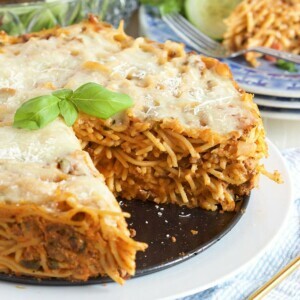 This delicious spaghetti pie is so fun to make and eat! Hello Lori. I just finished preparing this (in advance) for our family dinner tonight. It’s in the fridge now and I’ll pop it into the oven later. I’ve never made or eaten or even heard of spaghetti pie so I am pretty curious. I noticed that in the recipe instructions, you left out adding the onion and spice mixture (set aside in pan) to the pasta/sauce/cheese. I noticed it sitting there and just mixed it in but thought you might want to add this step to your recipe. Have a great day! 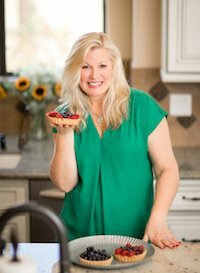 Hi Lori, Thank you so much for this simple and delicious recipe!! I made it last night and it was a BIG hit with my husband. 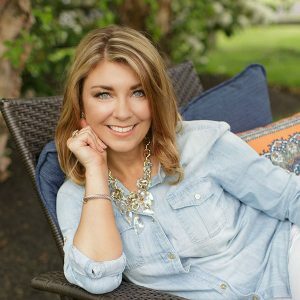 Thanks again for your wonderful blog! !